One of my favorite childhood breakfasts was a toasted bagel with cream cheese and strawberry jam. I took that same concept and made bars. And these bars definitely beat my bagel memories. Sorry bagels. 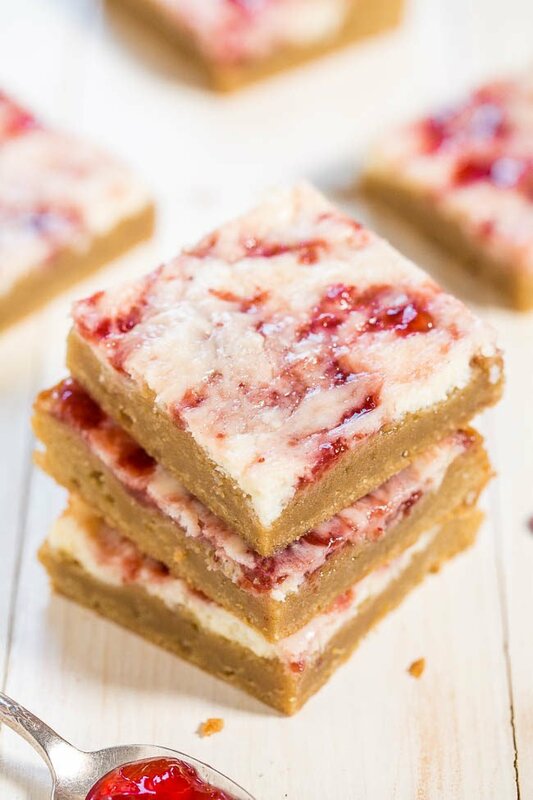 I called upon my trusty blondie base for these very soft, slightly chewy, buttery bars that are topped with tangy cream cheese and sweet strawberry jam. It’s an easy, fuss-free, one-bowl, no-mixer base and with 25+ versions and counting, it never lets me down. Over the years I’ve customized it with anything from Oreos to M&Ms to Pumpkin and here there’s cream cheese and jam. 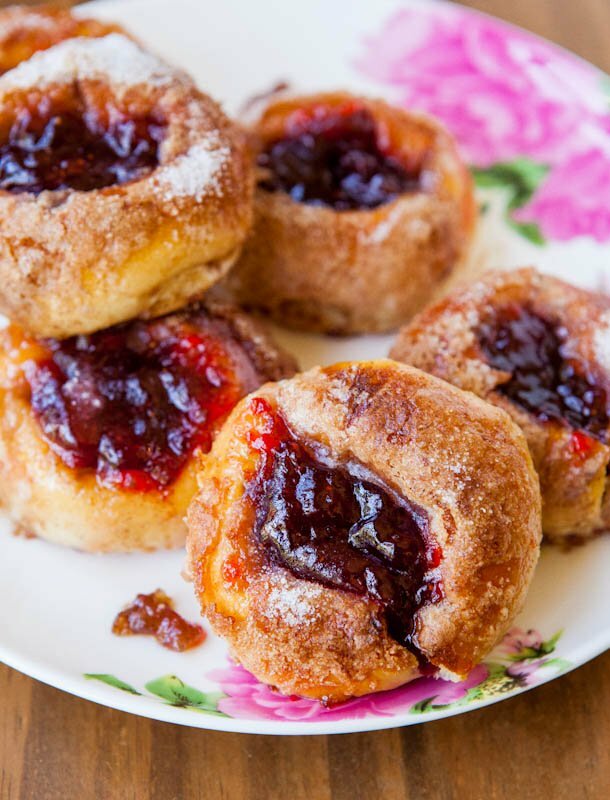 The bars are dense, ultra soft, and the taste contrast of the buttery bars, a cheesecake-inspired topping, and strawberry jam swirled throughout is just incredible. An entire slice of cheesecake is generally too rich for me but bars topped with just a thin layer of it, minus the work of having to make a cheesecake, a total win-win. One of my favorite childhood breakfasts was a toasted bagel with cream cheese and strawberry jam. I took that same concept and made bars. 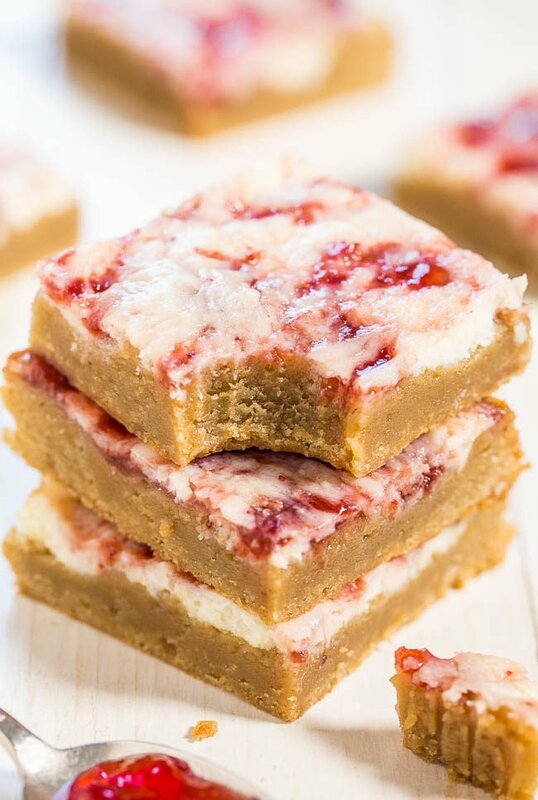 I called upon my trusty blondie base for these very soft, slightly chewy, buttery bars that are topped with tangy cream cheese and sweet strawberry jam. The bars are dense, ultra soft, and the taste contrast of the buttery bars, a cheesecake-inspired topping, and strawberry jam swirled throughout is just incredible. An entire slice of cheesecake is generally too rich for me but bars topped with just a thin layer of it, minus the work of having to make a cheesecake, a total win-win. To a medium bowl, add the cream cheese, granulated sugar, and beat on high-speed with a handheld electric mixer (or whisk vigorously by hand) until smooth and combined, about 1 minute. Turn the cream cheese mixture out into the prepared pan and using a knife or spatula, form an even, smooth, flat layer. Add the jam in small dollops distributed evenly over the pan (just eyeball 1/3 cup) and then using a spatula or knife, spread and swirl the jam into the cream cheese. Bake for about 30 minutes or until done. The edges should be set and while the center will be glossy and a bit loose, it should still be set to an extent and not overly jiggly. The toothpick test is unreliable because the bars will be done but the moist cream cheese layer will make the toothpick look wet. Bars firm up as they cool. Allow bars to cool in pan for at least 3 hours before slicing and serving. Bars will keep airtight at room temperature for up to 1 week, or in the freezer for up to 6 months. I’m comfortable storing desserts baked with cream cheese at room temp but if you’re not, store in the fridge, noting the fridge has a tendency to dry things out. Peanut Butter-Swirled Cheesecake Bars with Brown Sugar-Graham Cracker Crust – Easy, one-bowl, no-mixer recipe for cheesecake bars with peanut butter swirls! 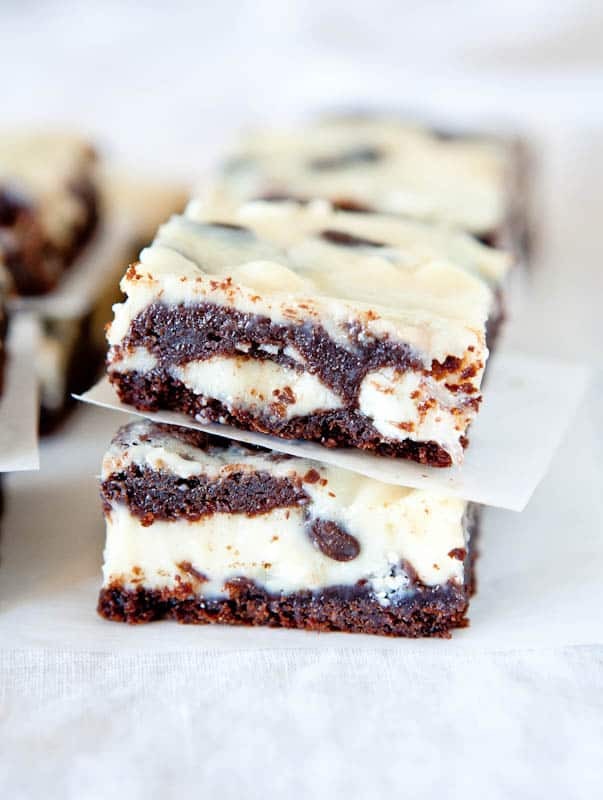 White and Dark Chocolate Cream Cheese Chocolate Cake Bars – Chocolate cake with chocolate chips, white chocolate chips & filled with cream cheese! Fast, easy, and foolproof! 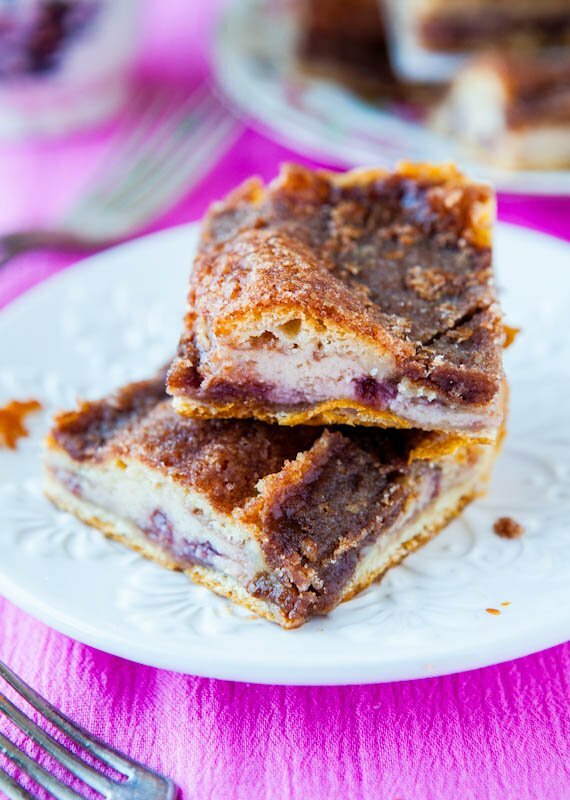 Cinnamon Sugar Crust Cream Cheese and Jelly Danish Squares – Uses one of my favorite shortcuts (Crescent Rolls) with jelly and cream cheese sandwiched between two flaky layers! 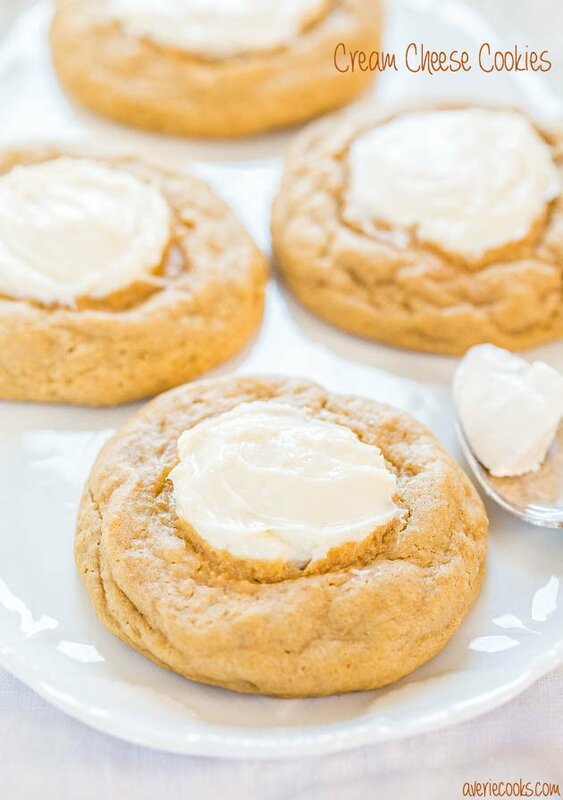 Cream Cheese Cookies – Big, soft, buttery cookies with sweet and tangy cream cheese in the middle! Best thumbprints ever! I can definitely eat a slice of cheesecake, but that’s about it. These I can slam back with abandon and not feel like it’s too much! I always love your bar recipes and these sound amazing! A perfect summer bar! I love a cookie crust in almost anything and these are like cheesecake with the crust to filling ratio reversed. 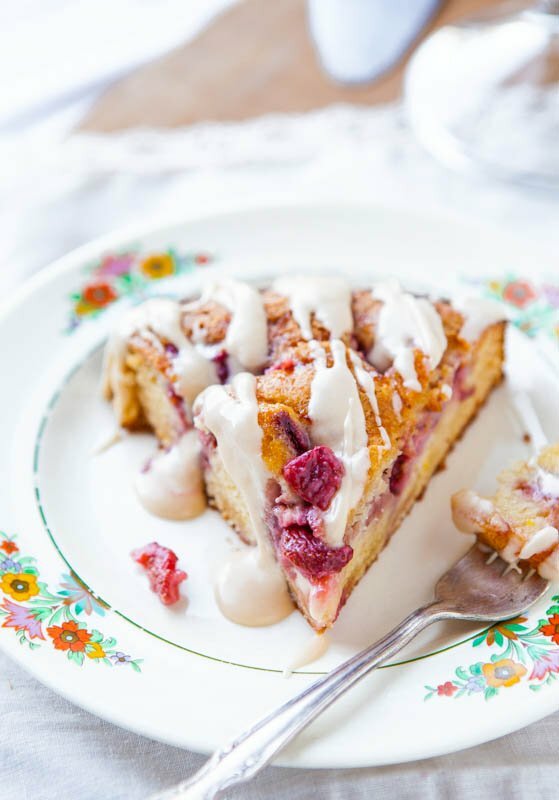 What a fun and pretty recipe to end the week with! Oh man! these look incredible! Yep, this definitely takes the cake for me. Strawberry bagels were my FAVEZIES! 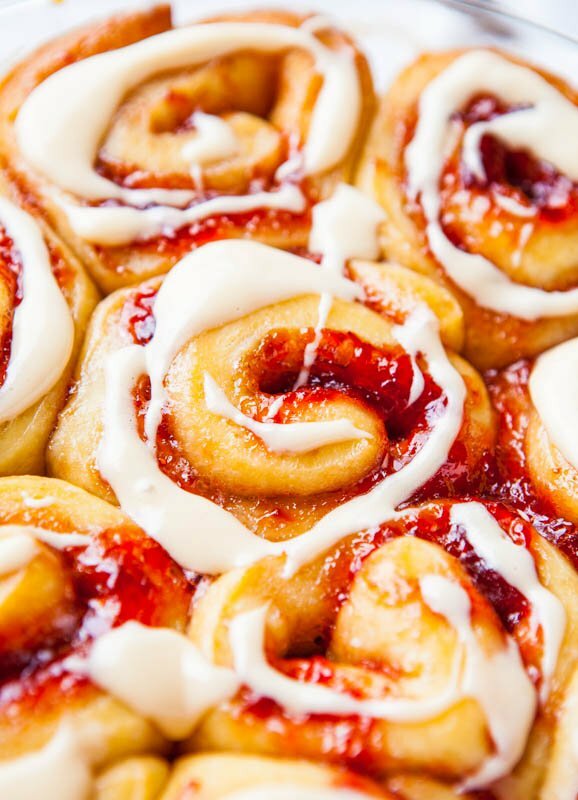 Leave it to you to make them into this mouth-watering bar. Ooh, this would be fun to take to a summer party. I’d skip the grilled food and head straight to the dessert table. 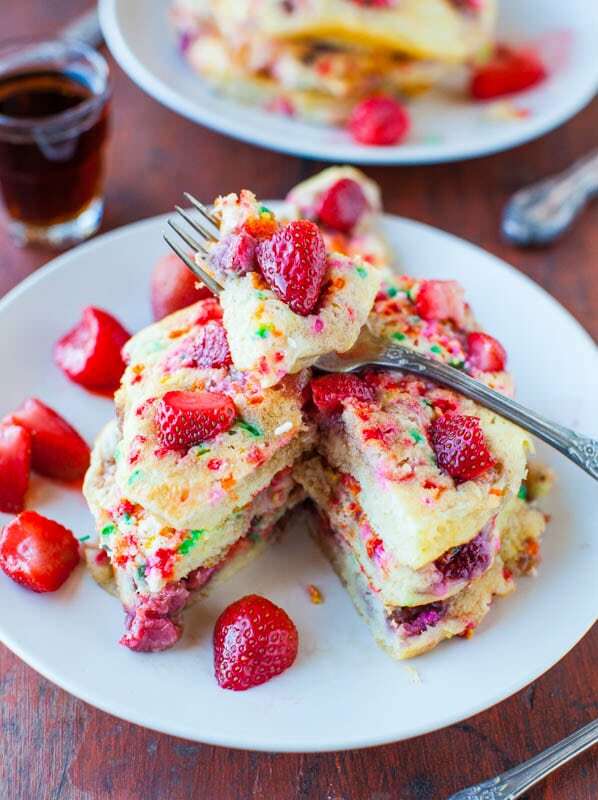 Obsessed with strawberry cream cheese.. well, and really all things strawberry! These bars look amazing! Pinned! These look amazing Averie! Can’t wait to try them! I went through a love affair with that bagel combo, too!! Especially since it included jam, a forbidden fruit in my house (don’t get me started – my mom had an aversion). 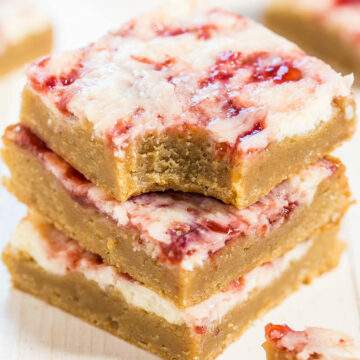 These look amazing, because A Cream cheese B cookie bars and C FORBIDDEN JAM! How could you not love these cheesecake bars? I love how they are portable too! They would be perfect for summer bbq’s or picnics! I would take these over a toasted bagel with cream cheese and strawberry jam any day .. but love the inspiration! Yum! My husband asked when I’m making these! Just wanted to confirm that there is no egg in the “cheesecake” layer…? Have you made a cheesecake layer using an egg? Do these come out with the taste and texture of cheesecake or is it more like a strawberry cream cheese? Thanks! I find that when I use egg in cream cheese items that are baked it can sometimes get a little too eggy for me. In this bar, I wasn’t wanting to notice that at all, so I left it out. I haven’t trialed it with an egg. The texture is somewhere in between true cheesecake and strawberry cream cheese. There is some creaminess like cream cheese has; whereas I think true cheesecake can almost taste dry. LMK how they come out for you. Thanks I will give it a try! 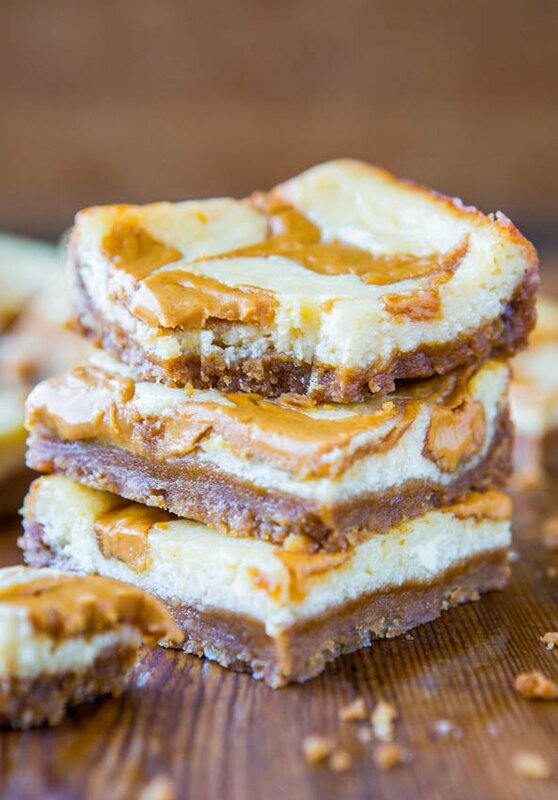 I also saw your peanut butter swirled cheesecake bars and omg those look amazing too. I will give the strawberry bars a try as is bc they look delicious! Perfect for my lunch box! I’ve told myself so many times to stop buying ready made ‘healthy’ bars! Off to the kitchen!